In “Winter Light” Yara Arts Group will perform a World Music Theater piece that includes the Koliadnyky, an ensemble of winter song singers from Kryvorivnia (Ukraine); scenes from the crisis in Ukraine today, and an 18th century Baroque Nativity folk opera staged by Yara artists. La MaMa E.T.C. will present the piece December 27-28, 2014, in its Ellen Stewart Theater, 66 East Fourth Street (in Manhattan’s East Village). The evening, created and directed by Yara’s Artistic Director Virlana Tkacz, celebrates Koliada, a winter ritual that now coincides with Christmas but is much older in origin and symbolism. Its oldest songs are preserved in villages high in the Carpathian Mountains, where the Koliada is considered to be the most important event of the year. Some people believe that spring and the harvest will not come to the village unless the songs are sung in every household. The songs are incantations that assume the magical power of words: “what is said, will be so.” These songs are featured in the first part of the evening. For the second part of the event, Tkacz has adapted and translated a Baroque folk Christmas opera from Ukraine. A highlight is the original 18th century music, as arranged by Julian Kytasty. Woven into the piece are scenes from the crisis in Ukraine today written by Serhiy Zhadan, Ukraine’s most important writer. Members of the musical group the Koliadnyky on the barricades in Kyiv February 5, 2014. Left: Mykola Ilyuk and Mykola Zelenchuk. Right: other musicians unnamed. Photo by Maksym Kudymets. Ivan Zelenchuk, is the lead singer or bereza of the Koliadnyky. Now in his sixties, he is the son of the man whose handwritten notebook of winter songs helped to preserve this tradition despite persecution under Soviet rule. Zelenchuk considers the Koliada his personal mission. He met the members of Yara Arts Group when they first visited his village, Kryvorivnia, in 2002 and has worked with them ever since. Mykola Zelenchuk, the son of Ivan, proudly carries on the tradition of his forefathers, both as a winter song singer and the best trembita (mountain long horn) player in the village. He also makes the traditional costumes for the winter song singers. He has taken part in Yara productions and was featured in its “Still the River Flows,” “Winter Sun” and “Midwinter Night” at La MaMa in NYC and at the Harbourfront Theatre in Toronto. Mykola Ilyuk is a master fiddler and plays most traditional instruments. He is director of the renowned Hutsul Instrumental Ensemble and has his own museum of musical instruments from the area. He was the master fiddler for Yara’s “Winter Sun” and “Midwinter Night,” as well as all the Koliada events in 2010-2013. Vasyl Tymchuk plays the tsymbaly (hammer dulcimer) and teaches children to play Hutsul instruments. He has worked with Yara since 2010. Ostap Kostyuk plays the duda (bagpipes) and various flutes. He represents the newest generation that has become expert in this ancient tradition and was featured in Yara’s shows in New York and Toronto. A variety of unique instruments are played in the Koliadnyky. Trembita is a Carpathian mountain horn made of hollowed pine tree that has been struck by lightning and wrapped in birch bark. Trembitas are used primarily in the mountain pastures. In the villages they are only used during the koliada and at funerals. The fiddle is played in the Carpathian style. 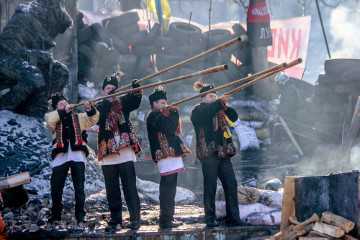 The musicians also play duda, a bag pipe made from a goat, and tsymbaly, a hammer dulcimer, and a variety of hand-made Carpathian flutes including the tylynka. Yara has produced a CD, “Koliada: Winter Songs and Music from the Carpathians.” For a sample with photographs see the video below. “Winter Light” is directed by Virlana Tkacz, who has created 25 original theatre pieces with Yara at La MaMa. These have also been performed in theaters and festivals in Ukraine, Central Asia, Siberia, China and Canada. Her production of “Fire Water Night” received two nominations for New York Innovative Theatre Awards this year. She was a recipient of the NEA Poetry Translation Fellowship for her work on poetry by Serhiy Zhadan. Serhiy Zhadan calls himself a “postproletarian punk” and is the most popular writer of the post-independence generation in Ukraine. His work speaks to the disillusionment, difficulties and ironies following the collapse of the Soviet Union. His readings fill large auditoriums and he performs with rock groups. Zhadan was born in Luhansk Region, today scene of the crisis in Ukraine, and lives in Kharkiv, in eastern Ukraine. On March 1, 2014, he was beaten by pro-Russian protesters. His assault created an international reaction. See The New Yorker (http://www.newyorker.com/books/page-turner/the-abuse-of-ukraines-best-known-poet). Virlana Tkacz and Wanda Phipps received a National Endowment for the Arts Poetry Translation Fellowship to translate his work and their translations have appeared in American literary journals and websites (see: http://www.brama.com/yara/trans-ukr.html), and are included in the anthology “New European Poets” published by Graywolf Press. The set and lights are designed by Watoku Ueno, a recipient of the NEA/TCG Design Fellowship. Projections are by Volodymyr Klyuzko, who was nominated for a New York Innovative Theatre Award for work on Yara’s “Raven.” Featured artists in the production include performers Marina Celander, Sean Eden, Alina and Teryn Kuzma and cellist Paul Brantley. Photographs and videos of the koliada ritual in the village of Kryvorivnia have been exhibited at the RA Gallery in Kiev, La Galleria and Ukrainian Institute in New York, Spring Street Gallery in Saratoga Springs, Bezpala-Brown Gallery in Toronto and as a major art installation at the Ukrainian Museum in New York. “Winter Light” will be presented December 27 to December 28, 2014, Saturday at 3:00 PM and 8:00 PM, plus Sunday at 2:00 PM. La MaMa E.T.C.’s Ellen Stewart Theater is located at 66 East 4th Street, New York City. Tickets are $25 general admission, $20 students and seniors, $10 children. Ten $10 tickets will be available to every performance on a first-come, first-served basis. The box office is reachable at 646-430-5374 and www.lamama.org.